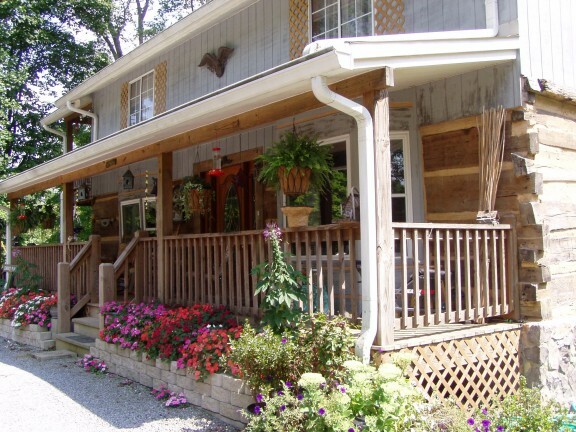 The minute the turn is made off the nearby highway and into the little lane leading down to her log home, a pleasant and welcoming atmosphere surrounds you. As you near the log home, the fact that someone lives there who appreciates nature and loves growing things is evident in any direction you look. The day my husband and I visited, hardy hibiscus with saucer size blooms greeted us, crepe myrtles that are tall as trees in several different shades showed their pretty colors, and brightly colored impatients were an explosion of color in beds in front of the house. Pebbled pathways leading to small benches in a front flower garden with multi-colored stones tossed here and there for touches of color glistened brightly in the sunlight. These are just a few of the many special touches that can be seen on LeNora Lane not too far over the Clay County line on Highway 52 traveling toward Celina. With each season, a multitude of perennials burst forth with bloom. The person responsible for all this natural beauty has not only created the many flowers beds that surround the house, she’s combined three separate log structures and made a beautiful, two-story log home for herself. One of the first things that stands out about the very attractive home is the size of the logs. They are enormous! Hack mark made back in the 1800's are visible on many of the logs. The owner of the home and the property is LeNora Metzing. As we sat in her kitchen that was once a one room log cabin, a large number of hummingbirds gathered around feeders hung on her front porch. The two story home was constructed from three separate log structures. Some of the old logs bear hack marks from the 1860's. LeNora was visiting in this area in 1992 when she noticed a "For Sale" sign on property that included the one room log cabin. After stopping to investigate, she knew then what she wanted to do. She told me the first time she drove down the lane onto the property, she felt like she "was home." Her only regret was that her mother, who many years earlier said she wanted to build a log cabin for LeNora and her siblings, was no longer around to share her dream. After the purchase of the property was completed, every spare minute of the next five years was spent on the hard work involved in getting the one room log home moved to another location on the property. Many weekend trips were made from Indiana to work on the property, and most holidays were used for that purpose too. LeNora’s grandson, Nate, often accompanied her from Indiana to help with the work. He also helped LeNora bring a camper down from Indiana so they might have a place to live in while the work on the log home was underway. Everything seemed to be going along pretty smoothly, until one day in 1993, when LeNora noticed some surveyors nearby. She made inquiry and was told about the possibility of plans for a new highway coming through. After learning of the historic nature of her home, department officials told her additional property might just be taken from her neighbors across the highway, sparing her home, but she didn’t want her neighbors to suffer because of her situation. Thinking she could solve the problem herself, she decided just to move the log cabin back further to insure her home would be out of harms way. Taking on this additional work was certainly unexpected, but she tackled the job thinking once it was done, she would be that much closer to accomplishing her dream. 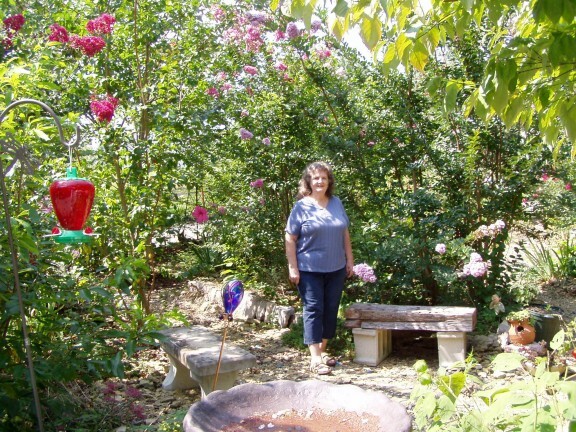 In 1997, LeNora retired from her regular job which allowed her to devote more time to getting the property transformed into a real livable home. After getting the one room log home moved to a place she believed to be away from any more involvement with a highway that might or might not be coming through, her next project was the purchase of one-half of another log home. This structure was built around 1840 and belonged to the family of a Civil War officer. Getting it moved and added to the house was the next step in the work plan. The third purchase was an old log structure originally used as a community smoke house that had been saved from a watery grave at the bottom of Dale Hollow lake. It too was moved and added on as another bedroom. Slowly but surely the two-story home came together complete with a front porch and comfortable rocking chairs to sit in and admire the beautiful flower gardens. When the grandchildren and great-grandchildren come to visit, a spacious loft with it’s own balcony overlooking the nearby woods is their favorite place to spend time in. Bunk beds made by one of LeNora’s daughters provide a good place in the loft for the great-grandchildren to sleep when they are there for a visit. LeNora pointed out special rocks the grandchildren and great-grandchildren placed in the construction of the stone fireplace. It’s so obvious that a tremendous amount of work and sweat equity have gone into the building of this historic log home, and most of it done without a lot of outside help. To say that LeNora Metzing is a determined lady is not an accurate description at all. And I’m sure those employees of the State of Tennessee Department of Transportation don’t particularly enjoy the idea of confronting her these days and for good reason. You see, after all she’s gone through getting her home just like she’s always planned for, after spending five years of her life running back and forth between her home in Indiana to a place she’s poured her very heart and soul into, and was finally, after all her hard work, being able to realize her dream, wouldn’t you know it! She gets word once again that new highway is in the works, but this time, she learns her home is right in the middle where it will be constructed. Have all the years of working so hard to accomplish her dream going to be in vain? And what about the fact that she’s gone through this once before and thought she had her home located where there would be no problem whatsoever should the highway come through. Most of the time, property owners faced with this situation don’t have any choice or any say in the matter. The Commissioner and the Department of Transportation are mighty powerful folks, but if they thought they are dealing with a senile little ole widow lady who couldn’t take up for herself, they soon realized that isn’t the case with LeNora Metzing. She not going down without a fight. She’s contacted state representatives asking for help, she called the Attorney General’s office in Chattanooga asking for a chance to have them hear her out, and she’s even written a letter to the governor. But she’s no dummy, she knows what she’s up against, she just wants to be treated fairly. If her property is to be taken from her, all she’s asking is that she be fully compensated for it, and that the whole thing be handled in a truthful and honest manner. She believes that’s the least the powers that be can do for anyone facing her dilemma. And I wholeheartedly agree. When I heard about LeNora’s situation, I knew it would make a good story, so I called her to inquire about a visit. We worked out the details of when and where, and I must confess, I envisioned a little ole white haired lady using a walking stick to get around. After all, I was told she is 80 years old. Sometimes we make assumptions that are completely wrong which certainly is the case here. I’m sure when we arrived for our visit, both my husband and my eyes bugged out of our heads when the front door opened and out walked an unbelievably attractive lady with beautiful natural curly shoulder length hair, wearing make-up, very hip earrings, with amazingly beautiful, wrinkle-free skin, and she gets around like someone half her age! She is truly amazing! And I have another confession to make. I surely would not want to be in the shoes of any of those Department of Transportation employees whose job it is to deal with unhappy property owners. LeNora Metzing isn’t someone any of those people will soon forget. She doesn’t hesitate to let her opinion be known, sometimes in a very loud voice, and to also make it perfectly clear she will not tolerate being treated as if she is incompetent and can’t take care of herself. All anyone has to do is to look around at everything she’s accomplished on her property, and it’s easy to understand why she doesn’t intend to just give up and hand it all over to them. In preparation for what’s ahead, she’s already had all the timber cut off the property, and told us she cried her heart out every time a tree came down. "After all," she said, "I’m a tree lover!" I wish her the best as she deals with this unfortunate situation. She has plans for saving her home and all the plants and flowers she’s so lovingly cared for all these years. Stay tuned for a follow up visit after all the dust settles once again. Hopefully, we’ll find LeNora is declared the winner in what seems like a very unnecessary battle for a place she says has been like living in heaven for the last 17 years. Good luck LeNora! We’ll all be rooting for you! LeNora Metzing stands in the middle of a flower bed she's created in front of her historic log home in Clay County.